Witnessed a new approach while in the waiting room for a cardiology appointment. Someone delivered at 60 inch flat screen TV along with an informational DVD. Can't count on docs having something to play these things back on without delivering it. The dimensions of these programs stood out in an article this week about one company that introduced a new $7.7 million speaker's bureau program and saw sales jump $287 million in the following quarter. It's like politicians. When they are collecting all that money to pay for their elections, the companies providing it are expecting something in return. So how will legislators who have their hands out ever do anything to change the way doctors are legally bribed to prescribe a particular drug? Edward, that is a new one! I guess we have to give them points for creativity, no? What's next, providing them with automobiles so they can drive to dinner to talk with some doctors and collect their consulting fees? I see a few different doctors. My primary care doctor has received $38, according to the Dollars for Doctors website. My rheumatologist has received $1,842. My psychiatrist has received $553. Marc, your investigative journalism skills continue to shine. Another amazing article! My neurologist – $420. He's a keeper. My GP was $900, my Neuro was $200. Okay my GP will get it first. My neurologist - 63K, my clinical trial study neurologist - 153K. Living in Lexington, KY I don't have many options. On the up side - I just completed HSCT in Israel with their support. They are both very interested in seeing how my MS responds. I think the almighty dollar prevails. My former neuro-a real sleaze, was number 1 in the state for pharma payoffs at 435K. Not really surprised. He also parked in the handicapped parking, because there was no other parking in the lot. I was barely walking at the time (7 years ago) and had to trudge 3 blocks for the appointment. Oh, and the buffet luncheons where the wheelchair bound patients had to try and wheel their chairs with full plates on their laps. My neuro in NYC - $675. In this age of "thousands and thousands" - it sounds like a pittance. I've been with my doctor for almost 20 years and really like him; so this amount doesn't seem to warrant a conversation. I agree with your assessment of your neuros relatively small acceptance of bribes. It's just incredible that this kind of thing goes on all the time, when it would be considered illegal in most other professions. But, as Edward mentioned, above, it's corrupt politicians making the laws governing corrupt pharmaceutical company practices, so is it really that surprising? lol just like lawyers, bankers, financial services sector and real estate agents. Mý neuro $7. I spoke to him once before about this and he suggested to me that the industry was slime. He's a keeper too. Great article. Thanks. Neuro: $27,134. That really depresses me. Endocrinologist: $1305. Primary Care: $1513. Hmmm. Upsetting to think that your neuro is taking in more money from the pharmaceutical companies than many people make in a year. Ridiculous. How depressing! My NYC Neurologist(MS specialist) 129,000. He's been my second opinion guy. Never liked him because all he cared about after my CIS was getting me on a drug. Just like my first NYC dr. I refused and both started to treat me like a 2nd class citizen. Problem is, Sadiq, the dr I want to go to doesn't take any insurance. Whats a girl to do? It's so frustrating...I am desperate for a Dr who friggin cares about the hell I have been going through. Any help out there? Any NYC or NJ Doc recommendations of someone I can trust? Someone I can trust... I think you hit the nail on the head Nicole. Nicole, Dr. Sadiq is my neurologist, and although he doesn't take insurance, my plan does cover 70% of the cost of my office visits to him. I just have to submit the claims myself. You should check your plan to see what the deal is. Insurance does cover any procedures he performs or drugs he provides. So, all things considered, it's really not that bad. If your plan doesn't cover "out-of-network" physicians, then you should still call Dr. Sadiq's clinic, as I think he does have some neurologists working there who do take insurance. It's worth a try, anyway. His clinic phone number is 212-265-8070. Geez, sounds like I'm shilling for him, but everybody in his clinic is very, very good (including the nurses, office staff, physical therapists, and other folks), and I wish all MS patients could be under his care or the care of one of the other neuros in the place. Call was already made last Friday after reading your Blog and getting disgusted with my current doc. Thank you for doing what you do. My son and I look for you in the city hoping to see you cruising around one day. Although, no one would want me to be in front of you with your camera....not a good backside view at the moment. ;) we enjoy those clips. Glad your feeling better and I'm always checking back for new posts. I looked up a lot of neurologists at various MS centers and a lot of them are getting a ton of money from pharma. And it seems like the more experienced and renowned you are the more money you get. There is a certain neuro in Philly who I wanted to see, but he had a long wait. I am glad I didn't go to him because he is getting 400k! Holy crap! My neuro is getting around 5K. Is that good or bad? I am wondering if you get money from pharma, does that really mean you are a corrupt doctor? What kind of payments raise a red flags? I see a lot for "food and beverage", "consulting", "education", which don't sound so bad. Then there is "promotional speaking", "honoraria" that definitely sound like shady business. Eh...i re-read your post and you explain consulting and honoraria. My brain is not that sharp anymore...thanks to MS. Pretty much all of the types of payments listed on the Dollars for Docs website can be considered pretty shady, even though accepting them is a pretty standard practice amongst doctors. Keep in mind, payments for research work are not included in the database, so all of those other fees paid are for promoting the pharmaceutical companies drugs in one form or another. How does one bring up this conversation with their doctor? What is the right etiquette? My neuro got peanuts compared to some others in his office. Most money was for a drug he never once mentioned to me. I think he is a good guy. my MS neuro got 12,500 from 2013 2014 mostly from copaxone. Neurologist $428, GP $242. My Neurologist is involved in many studies but doesn't push anything. I have PPMS diagnosed in 2002, on Copaxone last 10 years. Sounds like your doctors are pretty much on the up and up. Has the copaxone had any impact on your PPMS? My neuro - $7,562 (Aug. 2013 to Dec. 2014)...a little disappointed but she doesn't harp on me taking anything (I have SPMS and take no drugs but Vicodin - and I see a Pain Dr for that). Pain doctor only took $2,535 - I'm very pleased about that. Oooh, new Pain Management doctor only took $52! Yea, him! GP took $129. is it for U.S. doctors only? I do not see this neurologist, but he is promoted as the primary "MS Physician" in my area ... $207,000! He does participate in clinical trials. 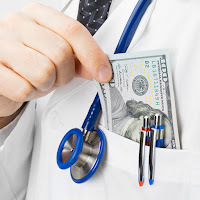 Is any of this money reimbursement for employee time completing clinical research data? As a former research nurse/clinical research professional, I know that physicians that participate in community based clinical trials do get compensated for the time it takes to evaluate and document treatment and response for patients receiving clinical trial treatment. Every side effect has to be evaluated to determine if it is connected to study treatment, severity, and duration. This takes a great deal of time. My job included screening for patient eligibility and enrollment in clinical trials, as well as coordinating and documentation of treatment. All of the documentation of clinical trial treatment was reviewed and monitored by an outside source, and I regularly met with those providing the oversight to answer questions and prove my evaluations were supported by source documentation. It was very time intensive and I only saw research patients. The only reason I was employed was because the physicians I worked for participated in community research trials. If the money covered the cost of employees to conduct the research, perhaps it may be legitimate? Physicians who participate in community based clinical trials make it possible for patients to obtain clinical trial treatment in their own community without having to travel to a big metropolitan center. Marc, as you suggested, a conversation with a physician may be in order if the amount on the Dollars for Doctors site is high ... or if you are certain that the numbers on Dollars for Doctors has nothing to do with clinical trials ... mea culpa. Well then, I can think of no good reason why this doctor should get 207K from pharmaceutical companies. I checked on the other 'MS specialist' in my area and he received $82,504! If I had taken the time to read the top paragraph on the Dollars for Doctors site, I would have seen that research money was not included. Marc, I live near Albany NY and there are only two 'MS Specialists' that I am aware of in my area and I chose not to see either of them for other reasons. Both are receiving considerable financial compensation from Big Pharma. I find this shocking and disheartening. Thank you for opening my eyes (although I do not like what I am seeing). As for the research remaining unbiased, research is a very time consuming and costly venture and many of those who are investing in research will gain financially from the outcome (Big Pharma). Evidenced based practice sounds good, but if medical treatment is based on the results of clinical trials and many of the clinical trials are funded by Big Pharma ... money continues to drive medical treatment. My neurologist received $44,842. I was surprised and saddened to find this out because I have had to travel an hour and half one way to see her twice yearly for the last 11 years. I have PPMS and am not on a disease modifying drug, although she did suggest I take Copaxone a few years ago. I elected not to do it. I find this whole post and its subject matter very appalling. I guess I have been unnecessarily naïve about Big Pharma. Thank you for opening my eyes. Sorry to hear that your neuro took so much money, and that you really don't have another choice. Remember, though, that just because he's taking the money doesn't necessarily mean that it's influencing his decision-making process, although logic would seem to dictate that it would. Neuro: $3,358, my PCP on the other hand didn't even show up. So yay for that i guess. Decided to look up my state (KY) and there's apparently an orthopedic surgeon that's received $1.05 MILLION. That's disgusting. $2500 for my neuro. Primary didn't show up. I'm getting HSCT this summer so no more CRAP drugs. But I haven't supported the drug companies the last 6 or so years. And my neuro didn't complain or pressure me much. My PCP took $648. Not bad, I think. Neuro took $4,717. Worse, but I like him anyway. The shocker (or maybe not because I know him) is my Dermatologist who took $97,328!!! I also know that "he" does many cosmetic procedures. I put the quotes around the "he" because he trains young girls to do some of them and then pays just over minimum wage. Usually I see one of his PAs who I like but I always question why my insurance pays the same for a visit with PAs as for doctors. Almost all of my docs didn't show up at all, but then, I don't have a Neurologist. My eye doc was the only one and it with a hit and it was only $28. So what would Food & Beverage" be? A seminar the doc showed up for that demonstrated equipment or something like that? Daphne, thanks for publicizing the site. People really need to know this info when choosing their doctors. Thank you Marc for the tremendous effort you put into researching and keeping us so well-informed. My neurologist works with the same team of doctors that work with your your doctor, Dr. Sadiq in New York. I was saddened to see that my neurologist earned over $20,000 in payments. I really like him and I feel that he's been the best neurologist I've ever had. So it's upsetting to learn this information about him. I don't know if I have the guts to ask him about it? Thank you for your effort. Outrageous. My neurologist 83,000. Former neurologist 200,000! My wife has seen two neuros - the first received $197.00, the second one (who is no longer local) got $236,000!!!!. She does many informational seminars on ms sponsored by Biogen. Some physicians in fact receive grants for research. Holy crap! My nero received $703,166 - #1 in my state (CA). I like the guy and he seems to have my best interests in mind, but maybe this explains why he is quick to discount any non-traditional therapies that I bring up. I guess it is good that I tend to "drive my own bus", I certainly listen to his opinion, but I decide what therapies I take on. Well crap. My neurologist at the medical school whom I love brought in $33,399. They break it down into categories of payment and drugs involved. He is mostly paid consulting fees for hawking Gilenya and Tecfidera. Although his famous neurology partner took in $340,000. I guess $33,399 is better than $340,000 but still..... Love that my family doctor took $181. With all that money floating around, you'd think they'd have made a bit more of a dent in actually treating diseases like MS, Lupis, Lyme, etc. And how come when I fill out a survey, I don't get no perks? Ut-oh. My new neurologist is supposedly the top one in Pennsylvania. He was telling me about some of these events he's attended where he's speaking about his own findings, then having drinks with a few other doctors afterwards. According to this list, he's made $403,184. And has a 70% chance of suggesting a brand name drug. His list of payments doesn't specify Tysabri by name, but he's always trying to push that in my general direction. Thank you for sharing your research knowledge and websites access. My first visit to Dollars for Docs... rendered me numb. Nothing on my neuro, but he is the Dean of the Medical School and he helps pull in a LOT of research dollars... so did my last, absolutely amazing neuro before I moved. We have done Plegridy, and now I'm on Tecfidera, which seems to work but MY, those gut side effects! I kind of prefer being in a research hospital with dedicated MS neuros who DO research. That was my first neuro's situation (he got me int he phase II Ocrelizumab trial, amazing stuff)and I hope to keep the one I have! Other than pretty much insisting I restart a med after I had a bad relapse that lasted two months, he's not pushy at all. Right now Biogen is footing my copay. It seems it is possible to balance my ethics with my MS--but perhaps not always possible in all cases.